The Kansas City Fringe Festival (KC Fringe) is officially underway, and Vicki Vodrey's Sue Aside... is one of several shows by MDC writers that are beginning their highly-anticipated runs. 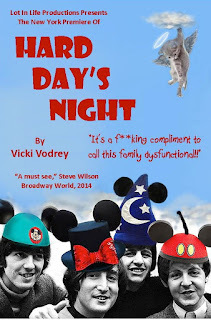 But for Vodrey, Fringe is a national affair--she has also been hard at work on Hard Day's Night--last year's KC Fringe hit that she is now producing, through her company Lot in Life Productions, at the New York International Fringe Festival (FringeNYC), which takes place August 14-30. Directed by New York-based Samantha Tella, Hard Day's Night is a darkly comic story of family dysfunction told from the perspective of Kelly K. Kelly, a 17-year-old outcast who craves a normal life and wants 'a beau.' Instead, she’s trapped in a world cluttered with Disney décor, pet ashes, Beatles’ lyrics and one hell of a crazy family. But as the play unfolds--after their last pet has died and company is arriving for her parents’ 20th anniversary--she may just get her wish. "Hard Day's Night is the closest to my heart of any play I've written to date," Vodrey says. "It's all about the relationships we have with our loved ones, whether they're humans or pets. It deals with our getting, or not getting, our needs met. It hopefully speaks to those who feel like the outsider and those who wonder if they're ever heard by their own inner circle. About feeling taken for granted. And yet, with all the frustrations our family and friends can bring us, we wouldn't trade them for anyone else. At least not most of them." Tickets for Hard Day's Night at FringeNYC are available online starting today. And don't forget to grab your tickets to Sue Aside..., KC Fringe performances start tomorrow!